We drove to Maligne Lake and hiked the 2 miles around the lake perimeter. Then we drove to Althabasca Falls and completed some short hikes there. I recommend visiting the falls, they are beautiful! Woolly Bear could not do some of the hikes into Caribou country, but otherwise, he was allowed to hike all of the trails. When we returned to our campsite at Whistlers, the momma Elk and babies were resting. Woolly Bear knew he could not bark at them and was a very good Airedale, watching the Elk from the confines of the camper, and later the screen house. [caption id="attachment_167" align="alignleft" width="640"] WB and me hiking Five Lakes of the Valley trail in Jasper NP. Charlie took the picture. 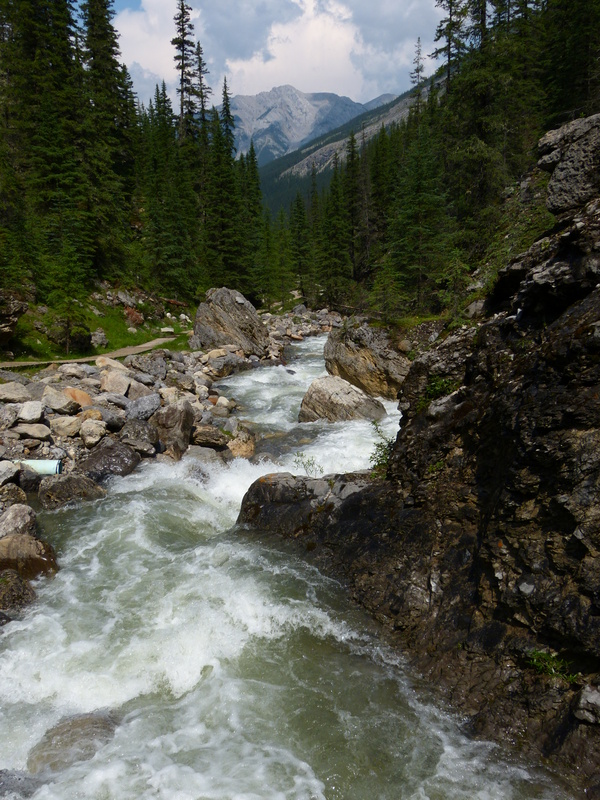 Friday, July 27th was our last full day at Jasper National Park. We really need to return for a much longer stay! We decided to hike the “Five Lakes of the Valley” trail. This was a short 3 mile hike, but had gorgeous views of the mountains and emerald blue lakes. We completed the hike before lunch time and found a scenic spot by the river to have a picnic. The sun graced us with her presence all day, and we meandered around the park, checking out little hikes and nature walks. 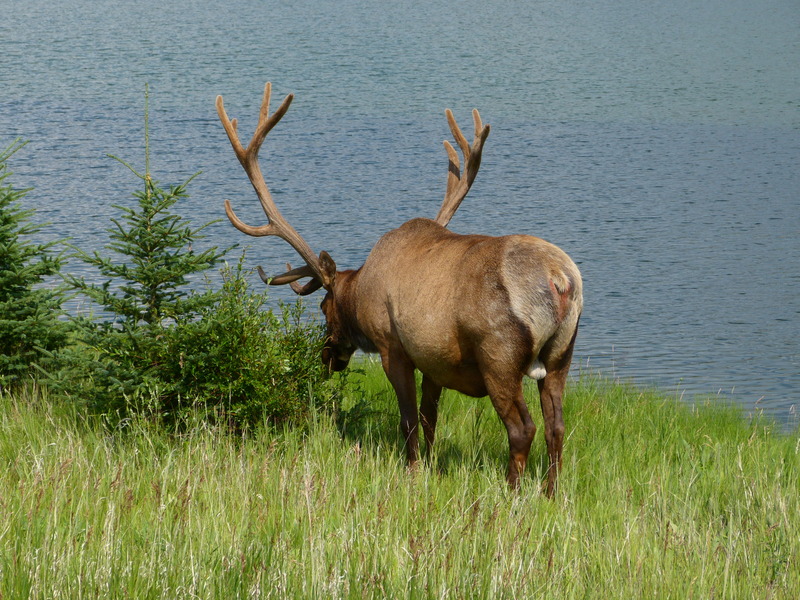 Elk by the river at lunchtime. The tail end of the Elk. He was one of many that we saw along the roadway or on the trails. 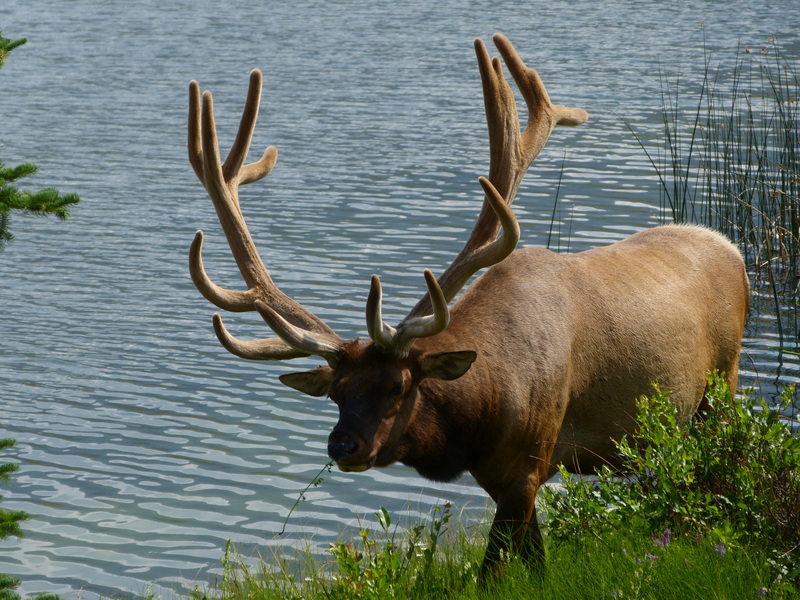 Another picture of the Elk. In the evening, we decided to take down the screen house, as it was dry and rain was predicted for that night. 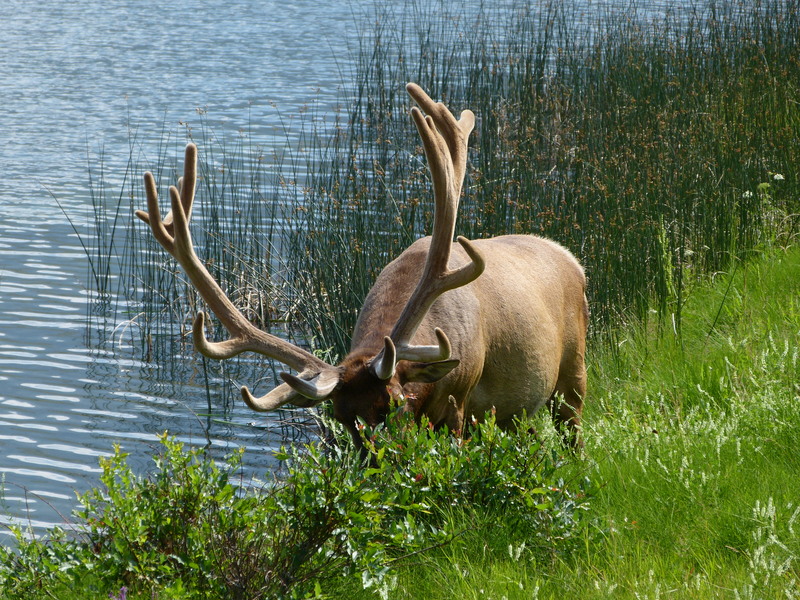 This entry was posted in camping, National Parks on June 27, 2013 by Ramblin' Rose. One of your pictures isn’t loading on here ! Other then that your pages are getting more and more creative 🙂 I can’t wait to read more!